High school seniors Alice M. Frawley and Matthew Stevens were named as Commended Students in the 2017 National Merit Scholarship Program. The students received Letters of Commendation presented by Principal Dr. Larry Washington. 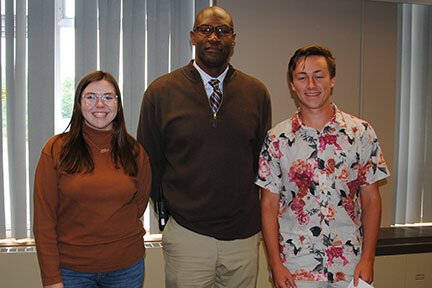 Commended students are recognized for their outstanding performance on the Preliminary SAT/National Merit Scholarship Qualifying Test given in October of 2015. Nationwide, over 1.6 million students took the test; 34,000 high performers were named Commended Students. “It is a great pleasure to honor Alice and Matthew for their exceptional academic promise. We congratulate them, and acknowledge their teachers for their able role in the development of academic talent in our high school,” Dr. Washington said. Alice Frawley plans to pursue physician assistant studies after high school, and is considering Duquesne University and Kings College. Matthew Stevens is interested in mechanical engineering and finance. He is exploring the University of Michigan, Carnegie Mellon and the Rensselaer Polytechnic Institute.